...with the Shaving Foam Technique! It's only cheap to buy, but you can really have some fun with this Shaving Foam Technique. The kids will love it. This Video Tutorial will show how to do this technique, and here are the things you will need to have a go at this project. Buy some cheap shaving foam from the supermarket(or pinch your husbands...). Some glossy photo card, and two or three different coloured inks. 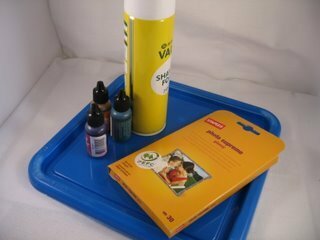 You will also need something to put the foam into, paper plates, plastic containers, or improvise.... and you will be surprised at what I have used as I had nothing else that was big enough. This is the end result from the inks I have used. I used my lovely Spellbinders to create the shape and I sparkled it up with some glitter spray. Add it to your cards as a topper, or use it as I have here for matting and layering. 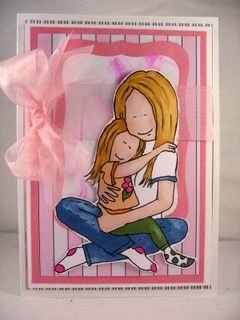 The big pink ribbon and the image make for a very pretty card. You need to check out their policy on how you can use the images before you start as some you can only use for your own personal use and others are there if you sell your work. I hope you enjoy it and I would love to see the results of your efforts.